The phrase ‘cycle time’ may not be familiar to you, but understanding its importance will undoubtedly help you to improve your business processes. Your business, in general, will also see a substantial difference that will be beneficial in several ways. Thankfully, the concept of cycle time in business is easier to understand than people may think. This makes it easier to implement the changes in order to get the maximum benefit. Generally, cycle time refers to the length of time it takes to get from the beginning of a process to the very end. There are different aspects of cycle time depending on the stage of the process, although it is usually associated with the concept of time that is determined either by you or your customer. Furthermore, understanding the concept of “delay time” is also key. It refers to the time whereby a unit of work is in the process of waiting for the next action. This should not be confused with the concept of “process time” which refers to the point where a unit of work is currently being acted upon to move it to the next stage. Cycle time can be used to improve business processes in relatively straightforward manner. 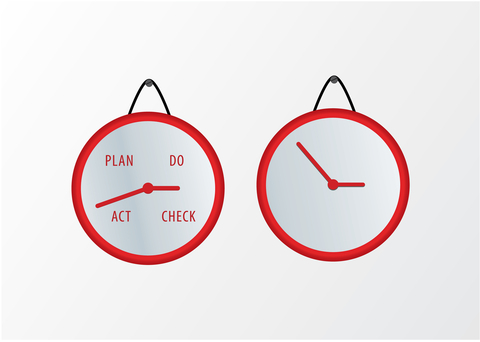 By fully understanding the exact time it takes for an action to be completed, you can look at ways in which that time can be improved. To do this, there is a need to examine each step of the process and to identify the length of time each action requires to be completed. This will clearly lead to things becoming more efficient, as well as saving time and money. It is important that things are indeed broken down into stages which can then be examined independently. It will also prove to be beneficial to understand the cycle time of each stage to provide you with a figure that you can then work on. Using the concepts of Six Sigma, there are several things that you can do in this situation. First, you can discuss the issues with each staff member to think how the processes can be streamlined. This may involve buying new equipment or better training as well as making sure that the right people are in the right positions. By identifying problem areas, it will allow for changes to be made so that ultimately someone with the superior knowledge and experience can be hired to move things forward. Furthermore, the cycle time should also be aligned with a strategic plan that details individual’s approach through each stage. This can help to streamline things as much as possible, reducing the time for the process to be completed. By studying the methodology, you will have a clear vision towards the point of perfection that we are all trying to achieve. Clearly, there will be a limit that cannot be reached within the processes but knowing where improvements can be made is essential for future success. From a business perspective, being aware of the cycle time is important because it applies to a number of different industries since every business has to encounter this concept of the cycle time at some point. It encourages you to pay close attention to various parts of your business processes and to seriously contemplate the changes which will be beneficial to you. It will reduce waste of time and effort, leading to things becoming substantially smoother. By looking at something as simple as cycle time in an introspective manner encourages you to re-examine everything you do rather than just accepting the norm. Just because you believe things are running smoothly doesn’t mean that it cannot be improved. But it is something that you will never know unless you are aware of the cycle time concept. The post Understanding Cycle Time to Improve Business Processes appeared first on Shmula. How Does Continuous Improvement Help Procurement? New to Lean Six Sigma? Start Your Journey the Right Way!